Clancy the Great is of the more peculiar entries in the annals of Ideal Toy Company’s product lines. 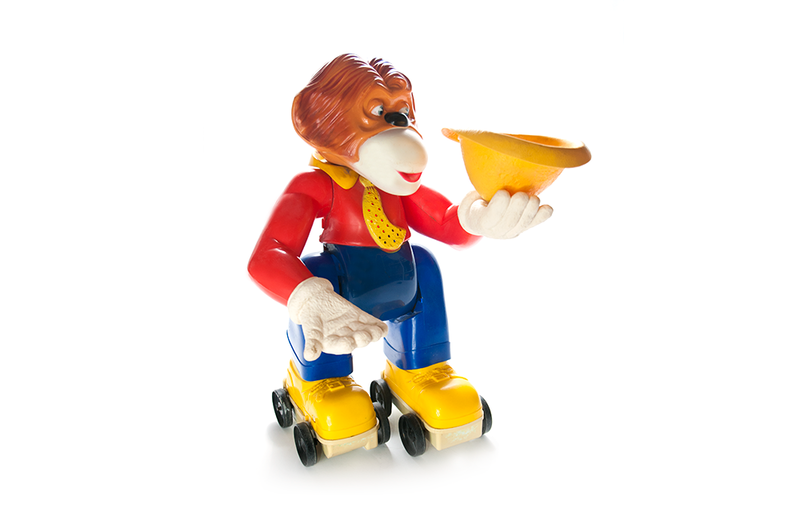 Released in 1963, the roller-skating monkey was designed by Marvin Glass & Associates of Chicago. By holding his left hand and pressing the red button on it, you could walk beside Clancy as he skated and moved his head slightly from side to side. If you attached the hat in Clancy’s left hand with the feather facing forward, you could throw loose change into the hat, which would cause Clancy to skate towards you. The toy came with two metal “coins” to help you if you’d run out of allowance money. Clancy stayed on store shelves for several years before skating off into the sunset. Board games can be categorized into two camps: those that stand the test of time, and those that serve as windows into a moment of time in popular culture. Released in 1960 by Mattel, Barbie Queen of the Prom relies on a series of clichés and politically incorrect attitudes towards girls that today seem cringe-worthy, but which permeated and defined culture 50 years ago.